V.W.Bro. Robert J. Hilton, 33o, PPG Secretary. 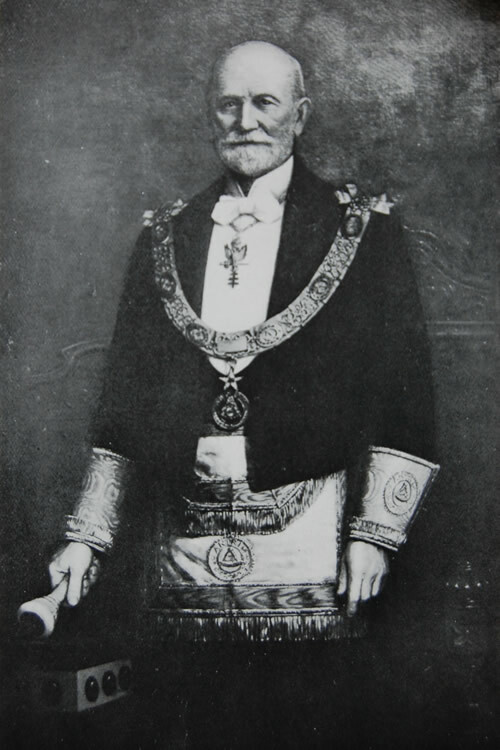 Provincial Deputy Grand master, Antrim 1897-1916. Trustee, Masonic Hall, Arthur Square, Belfast 1870. V.W.Bro. Robert J. Hilton, 33o, was a life-long member of the Order and worked his way up from the ranks to that of provincial Deputy Grand Master. For many years previously he acted as provincial Grand Secretary, in which position he was very popular with all classes of brethren, and took a keen interest in the management of the hall in Arthur Square. His name appears in the list of the first house committee for 1869, and for some years he acted as treasurer. He was also one of the original trustees under the 1870 lease. On the lamented death of R.W.Bro. Valentine, PDGM. The Marquess of Hertford, PGM, appointed Bro. Hilton his deputy – a selection which was very popular and gave much satisfaction throughout the Province. He filled this high position with much acceptance until a few months before his death, when failing health necessitated his resignation, much to the regret of all his brethren.